Let me start today’s post by ashamedly confessing that I doubted Donna Hay. I did, I must admit it. I made these cheesecakes and they looked so cute in the oven, I thought that adding the crumble topping would ruin them. But I’d already melted the butter, so I carried on with the recipe. 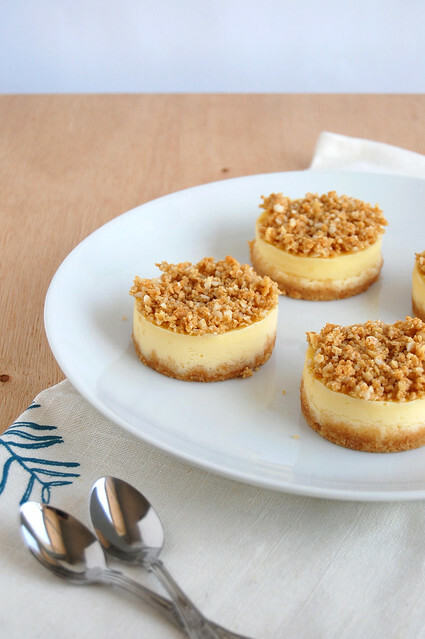 The topping is delicious and goes perfectly well with the smooth, creamy cheesecakes. Preheat the oven to 140°C/285°F. Make the base: process cookies in a food processor until crushed. Add the almond meal and butter and process until combined. Grease a round 22cm springform pan and line the base with baking paper. Press the crumb mix over the base and refrigerate (I left it in the fridge overnight). Place the ricotta and cream cheese, in a food processor and process until smooth. Add the sugar, eggs and vanilla and process until combined and smooth. Pour the mixture over the base and bake for 1 hour and 10 minutes or until set. In the meantime, make the crumble topping: place the cookies, macadamias, vanilla, sugar and butter in a food processor and process until roughly chopped. After baking the cheesecake for 1 hour and 10 minutes, top it with the crumble mixture and bake for a further 10 minutes or until top is golden. Allow to cool in the pan, then serve. I enjoy reading DH magazines and trying out some of her recipes too. These cheesecakes certainly looks very inviting. Love the crumble topping. ohhhh, I have some lonely ricotta in the fridge! This may have to be a weekday treat. The cheesecakes look lovely, pure perfection! 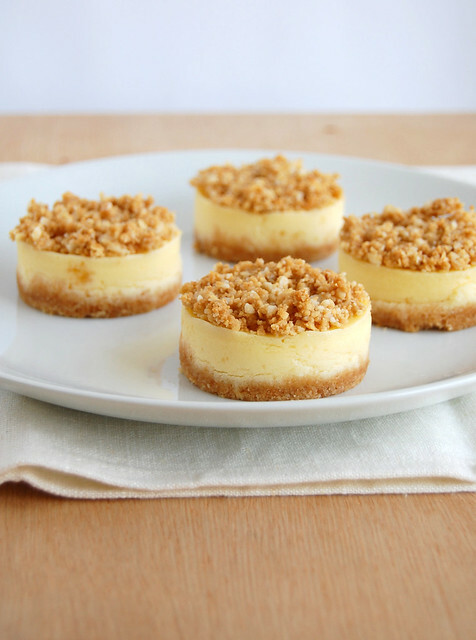 I always crave for cheesecakes, but this one with a crumble topping must be more than marvellous. Superb! This would be ideal for me to make and serve to friends for a special treat. Katrin, thank you for stopping by! You are far to kind - I'm very glad you enjoy the blog! Thank you - you're sweet! Susan, I hope you like it, darling! Joey, thank you! Another one of Donna's winning recipes! Shabs, thank you for stopping by! Jess, thank you! The topping is really good. Yolanda, these are good - I hope you like them as much as I did! I'm a crust person so the fact that there's a delicious crust and a crumble on this makes it look SO good to me! I have a giant tub of ricotta cheese and I have no idea what possessed me to buy it... and now I know! Have to get me some springform pans today I guess since I don't own one. Your pics are gorgeous, as always. I think the crumb topping looks adorable! And of course who doesn't like mini-desserts? Super cute. Do you think I could make these in a muffin tin? Gary, I hope you like it! Thank you! Marisa, thank you! I'm a sucker for all things mini. I think you could - not sure about the unmolding, though; I think it would be complicated. Miki Mix, tks for stopping by! Hope you try the recipe! @Patricia Oh right. Hadn't thought about that. Guess I would use some pretty liners then and serve them in those as well. Thanks for reply!